The dance scene in the Philippines has been anything but stagnant for the past few years. If anything, teams have risen up and have made themselves known to the community without the exception of LMN. This team is a union of dancers originating from different high schools and colleges. Led by Coach Jazz Zamora, LMN is known to always bring something fresh to the table, with flavors squeezing out from its unique performances. 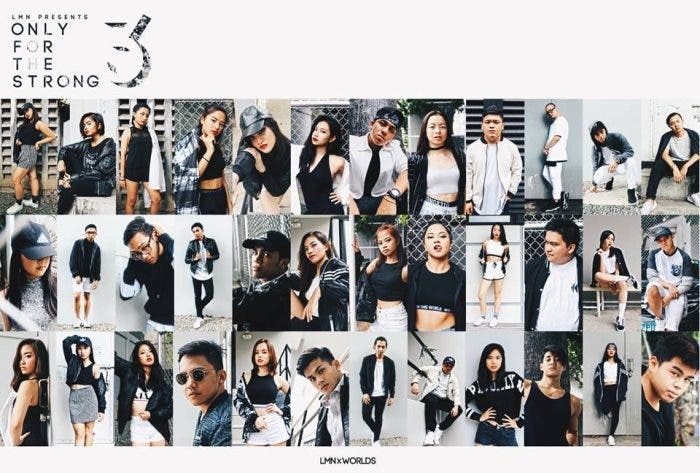 On its third year, the team bagged the championship in the varsity division of the recent Hip Hop International Philippines National Leg, securing a slot to represent the country in the World Hip Hop Dance Championships in Las Vegas, Nevada for the third time. There are high hopes for the 8-man varsity team as its members have their eyes set on bringing the gold home for the Filipinos. LMN presents: Only For The Strong III, a fundraising concert to send its varsity team to represent the Philippines in the biggest Hip Hop competition in the world. OFTS III will be held on July 23, 2016, at Henry Lee Irwin Theatre, Ateneo De Manila University. The team, along with its guests Tha Project, TPM, Red Ph, Team Rocket, Recab, A-Team, and Lil’ Peepz, aim to bring the community together and to share to its audience of over a thousand the true Filipino talent that is ready to show to the world stage. Support LMN and take part in its journey to bring pride to our country! Three years of growth. Three years in the making. Three years strong.